not the actual poster from my memories…OR IS IT? CATS was the first show I ever saw on Broad-WAY. I was in 7th grade and saw it as part of a trip to NYC with my local choir (we were singing at Carnegie Hall, thank you very much). I don’t have many specific memories of the production, and the most special part of that evening had little to do with the musical itself. 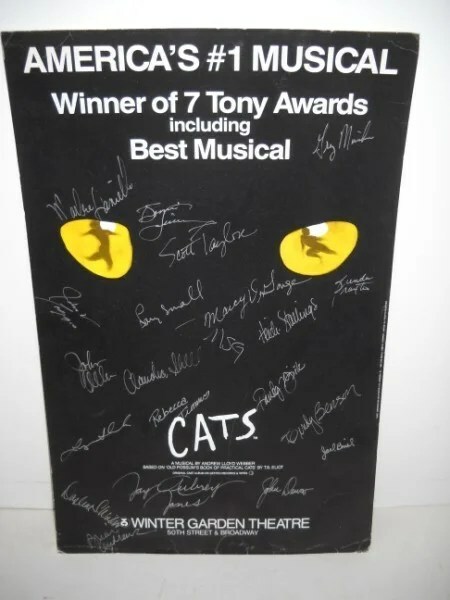 As part of the production’s efforts to raise money for Broadway Cares (though I’m not sure it was called that in 1996), they sold the a show poster signed by the cast. But instead of selling them in the lobby after the show, as is fairly standard fundraising practice now, they sold them ON THE STAGE OF THE WINTERGARDEN THEATER DURING INTERMISSION. I had no money for such a purchase, but obviously wanted to go up on the stage. One of the girls (Carlyn) in my choir was there with her mom, so they invited me to come up with them as they bought their poster. For whatever reason, even though I wanted to go, I was terrified I would be discovered as an interloper who was storming the stage despite not buying a poser myself. I thought they would DEMAND I give them poster money or TOSS me off of the stage (or maybe even out of the theater). I didn’t know how Broadway worked! They never sold posters onstage in Cleveland! I volunteered to act as Carlyn’s brother, thinking that cover story should get me past these imaginary poster police, and was kindly told by Carlyn’s mom that such machinations weren’t necessary, that I was allowed to go up with them just because I knew them. So, with great hesitation, I went. It was a very exciting–I met Old Deuteronomy! But the excitement didn’t quell my anxiety, so as we were leaving to stage to return to our seats I felt compelled to make it ABUNDANTLY CLEAR that I was there under my idea of legitimate pretexts. I said to Carlyn, loudly, in the hokiest voice imaginable, “Gee Sis, that was great! I’m really glad we got to do that!” Carlyn and her mom laughed about that for the rest of the trip. I continued to maintain that was perfectly rational behavior and didn’t understand why they were so amused.